From the Great American Burger website. "...Try us and you'll be convinced! Our recipes are authentic and time-tested. The ingredients are always fresh; meat is never frozen. The result? 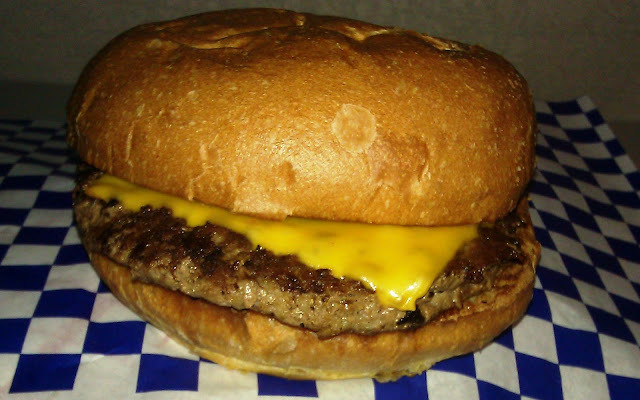 A burger that bursts with flavor...."
The Great American Burger truck was parked outside of my office at lunchtime, so this review truly amounts to me blundering into an attractive nuisance. I ordered a Great American Burger ($8.50....what? ), and I passed on the fries. It was nice that they used Square rather requiring me to pay with cash. My burger was ready in about 5 minutes. The Beef: The wispy, thin, 3-ounce patty was cooked to a slightly chewy Well-Done. The beef was plenty beefy, and it was properly seasoned,. Beyond that, it was nothing special. The 100% Angus Chuck was fresh. The burger patty was a on the dry side, and the coarsely ground beef provided no complexity to the bite. The beef was perfectly average and about one might expect of a truck-sourced burger. The Seasoning: Great American Burger liberally applied salt and pepper to the patty of my cheeseburger. This was a welcome addition to the otherwise tame beef. The Sear: The kitchen got a surprisingly good sear on the thin burger patty. While the sear was not crisp, it did serve to amplify the beefiness of the dish. The Preparation: The burger patty was uniformly round and thin. I assumed that Great American Burger took delivery of pre-formed patties. The burgers were seared on a very hot, gas-fired flat-top to a dryish Well-Done. The Cheese: My burger arrived with a slice of nicely melted American cheese. The gooey cheese rescued the burger from being too dry. The cheese also served to add a little complexity to the flat flavor profile. The Bun: The Brioche-style bun at Great American was a big, bready, yeasty, and slightly sweet affair. It lacked any buttery notes, so it looked like a Brioche, but it did not taste like a Brioche. The bun was a little on the dry side, and that was where the cheese barely saved the day. The bun was only toasted along the edges. The Meat To Bun Ratio: The weakly toasted bun simply dwarfed the burger patty at Great American Burger. Maybe a triple cheeseburger...fully loaded with toppings and sauces would have made sense with that bun. 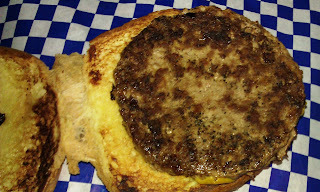 The meager, single beef patty was no match, and the resulting bite was overly bready. The Toppings: The Romaine lettuce leaf was fresh and crisp. The Roma tomato slice was ripe and juicy. The Value: WEAK. $8.50 for a very meager portion of beef was a bad surprise. 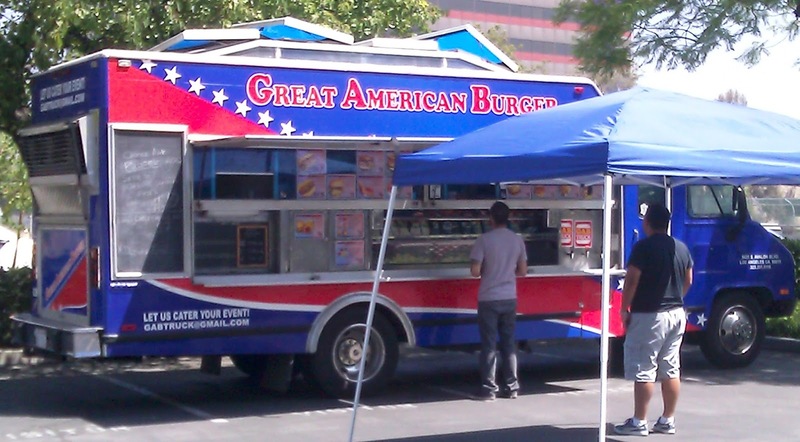 I popped over to the Great American Burger truck due to it's convenient proximity to my office. I shall not make the trip twice.